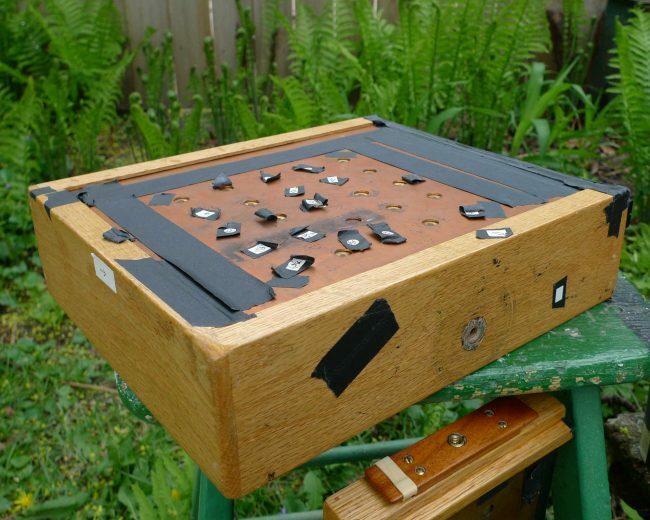 The pinhole cameras I use are built from scratch using oak and assorted fittings. 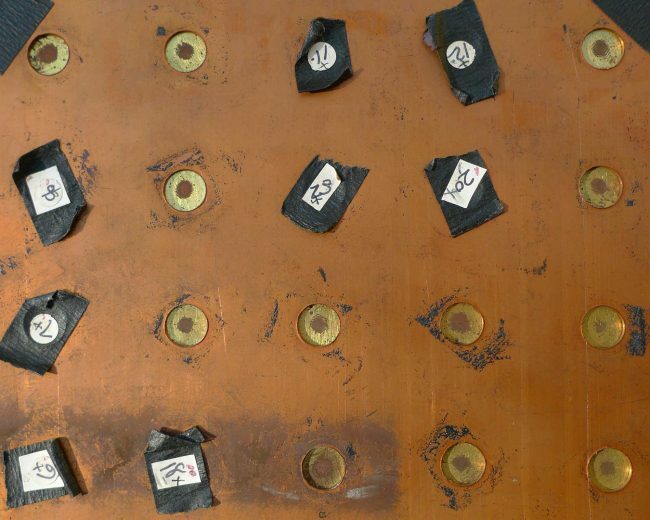 Removable face plates (cut out of a brass kick plate from the Leamington Hotel, 1912-1990) fit on the front of the camera. Different plates can be swapped depending on whether a single pinhole or array of pinholes is going to be used. By nature, the very small aperture produces an image of equal sharpness (or softness) from the pinhole out to infinity. 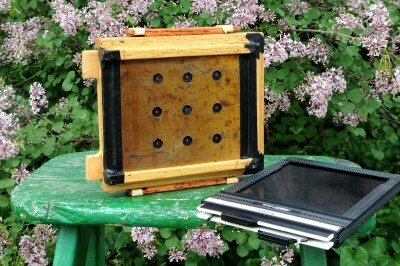 The 4×5 multiple aperture pinhole camera has 9 pinholes arranged 3×3. The 8×10 camera has 25 pinholes arranged 5×5. The focal distance (pinhole to film plane) is very short to allow each of the 9 or 25 exposures to expose a distinct image that vignettes but still blends with its neighbor on the sheet of film. Both 4×5 and 8×10 cameras accept sheet film holders and a dozen (24 sheets) is usually enough for a day in the field. A tripod and level keeps the camera steady and true during the long exposures. There is no viewfinder so it’s never certain what will be recorded on film. Whatever is imagined during exposure is never quite what develops in the tray. 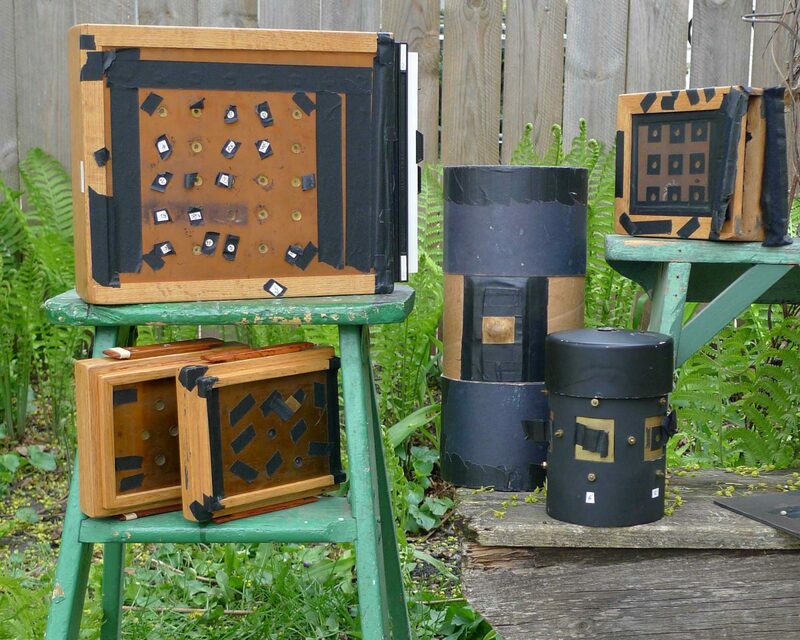 Video of the multiple aperture pinhole cameras and photographs.